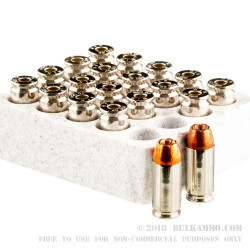 Using the same handgun ammunition as law enforcement professionals not only ensures that you are getting the best quality, it is the most defensible position that you can take should you be dragged into a court of law. The Winchester 165 grain .40 S&W Jacketed Hollow Point is the round that law enforcement officers choose to carry both on and off duty, and one that will provide you the ability to stop any threat should the moment ever arise. 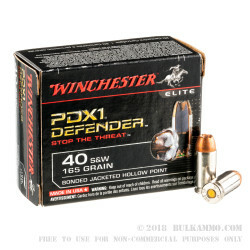 Winchester’s patented PDX1 bullets are engineered to maximize terminal ballistic performance, as well as defeat intermediate barriers such glass, drywall, and plywood during close quarters combat scenarios. The 165 gr. 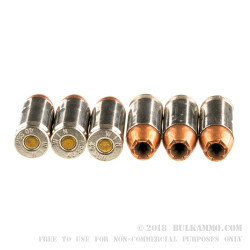 JHP is sheathed under a thick electro copper plated jacket, and retains over 97% of the bullets weight upon impact and subsequent formation of the terminal cavity. 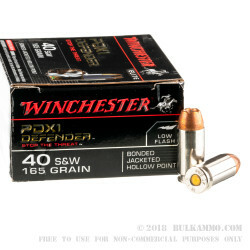 Capable of defeating heavy clothing such as denim and nylon taffeta, the Winchester 165gr .40 S&W Jacketed Hollow Point travels and an average muzzle velocity of 1,140 feet per second, and is one of the most lethal .40 caliber handgun rounds anywhere on the market today. Law enforcement and civilian personnel looking for a defensible solution for their duty or protection pistol will be well served by the Winchester 165 .40 S&W Jacketed Hollow Point.